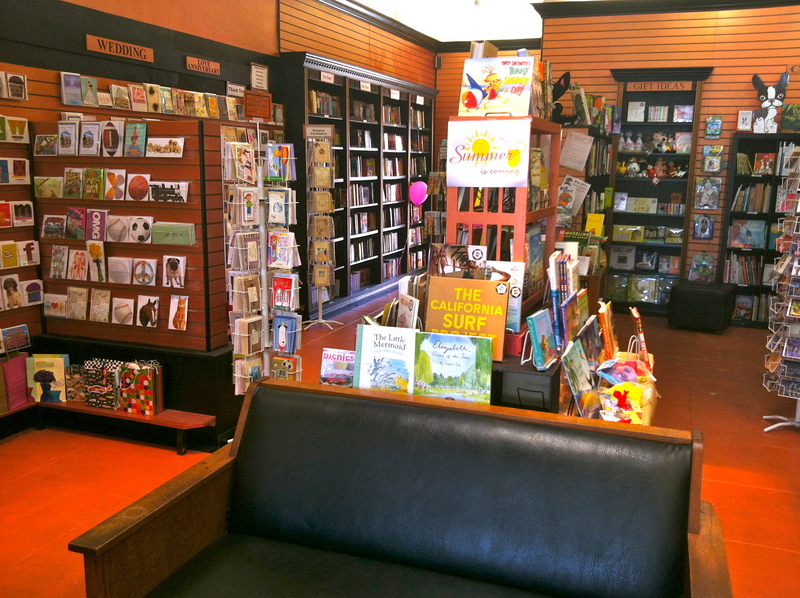 Apostrophe Books is an indie bookstore in the charming seaside community of Belmont Shore. I met the owners, Valerie Kingsland and Lisa Somerville when I asked if they would be willing to carry my picture books. As an indie author, I was and still am accustomed to not being given the opportunity to share my picture books. Firstly, I don’t have star power so I could potentially be a waste of time and space. Secondly, I’ve been told that my bilingual picture books written in English and Spanish wouldn’t have an audience at their bookstore. And lastly, the term indie author screams, “Cheap, low quality, poorly written and just plain bad”. However, as I peddled my books at Apostrophe Books, they did something very surprising. They gave me my very own story time and book signing – WOW! Since then I have come to really appreciate and admire the love and dedication Valerie and Lisa, as well as the rest of the Apostrophe Books staff put into the bookstore. Simply put, it’s a love affair. Unfortunately, Apostrophe Books is in dire need of financial support to stay open. They are running an INDIEGOGO campaign which will run until October 1, 2014. There is also an individual that is matching all contributions from now until September 15, 2014 up to 10,000!!! I hope people who are thinking they might contribute will do so during this time. Every penny counts. I’m rooting for you Apostrophe Books – fingers crossed. What motivated you to open a bookstore? We have been in bookselling since the early 1980’s. I guess you could say bookselling is in our blood. An opportunity to open our own bookstore presented itself in 1993 while we were living in Port Townsend,WA. We had the store there until moving it and ourselves back to California in 2005, where the store has been ever since. We are both book lovers and are passionate about bookselling and being involved in the community in a positive way. Bookstores are not only a place to purchase books. They are a meeting place for bibliophiles and a place that people look to for events such as author signings, poetry readings, children’s storytime, book club meetings. A community gathering place, if you will. What makes Apostrophe Books special? 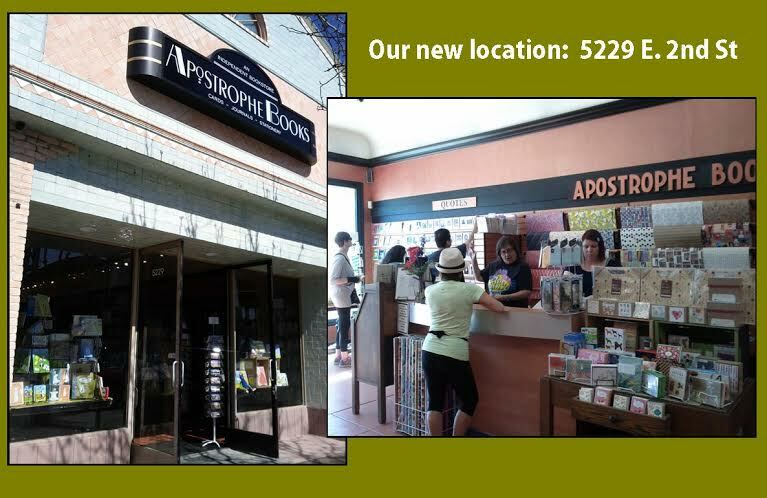 Apostrophe Books has become a part of the community, something we have strived to become when we relocated the bookstore to Belmont Shore in 2010. We will special order any book in print for our customers and often have the special order within 48 hours with no shipping charges and also give the customer a 10% discount. As a matter of fact, all of our books are discounted 10% to 60% off of list price every day. We also carry greeting cards, many of which are from local artists, including handmade, one of a kind cards, boxed notes, journals and wraps. We are also very proud to host local authors every Sunday to give them a forum to present their book (s) when they might not have a place to do this otherwise. We’ve been holding “LOCAL AUTHOR OPEN TABLE SUNDAYS” for three years now and we always carry local author titles on consignment after each event. In a time where books are readily available on places like Amazon, how do you manage to stay afloat? There are huge challenges in the retail book industry. Not only at the present time, but for several years now. For example, Amazon using precious books as “loss leaders” (they admit they make no profit on books because they are used by them to draw customers to their website in hopes those customers will then buy other products) when traditional, retail brick and mortar bookstores have rent and employees to pay. We simply cannot give books away at such a deep discount as Amazon. They have thousands of investors as well and very deep pockets. Making a profit on books isn’t something they need to do, hence the big discounts. They are making a profit on so many other items, books are sort of an afterthought to them, a kind of “lure” to bring customers to their website. Staying afloat in the age of AMAZON is a huge challenge as we witness small indie bookstores closing across our country. We are not able to compete. And it isn’t only indie bookstores – Borders, & Circuit City have gone under as a direct result of Amazon undercutting prices. Now, Best Buy and Radio Shack are close to closing and even Barnes and Noble is in trouble. Now that Amazon is delivering groceries…will grocery stores be next on Amazon’s chopping block? Where will it end? Countless jobs are lost and it is very sad. Apostrophe Books finds itself in danger of closing now, too. We are in the midst of a fundraising campaign on Indiegogo.com to save our bookstore from becoming yet another casualty of Amazon. We are hopeful that our customers, near and far, will choose to support the bookstore as an important part of their community, a place to purchase real books for generations to come. We have a website, too, with over 2.5 Million titles to chose from for those of you that prefer shopping online. Please try our website – most books are discounted! What would you like to share about Apostrophe Books? We said a lot above! That’s really what we would want to share about Apostrophe, that it remain standing so that the next generation growing up will know what a real bookstore looks, feels and smells like. Please don’t let bookstores become a thing of the past. That ordering online or downloading a book is all that future generations know. That we can remain an intricate part of the community, giving shoppers a choice where shoppers can engage in conversation in person with not only everyone that works at Apostrophe Books, but also with other customers sharing their enthusiasm about a certain author, or book, or topic. Bookstores can be great gathering places without all the TV screens screaming at you. Just some nice music and a slower pace. A place to be able to take a deep breath and relax. Which book is your greatest treasure and why? Too many great books to chose from but probably any of Thich Nhat Hanh’s titles. He is inspirational in a very gentle, quiet way. Peaceful. After reading one of his books, you will most likely be thinking about it for a long time afterwards. Funniest moment in the history of Apostrophe Books? 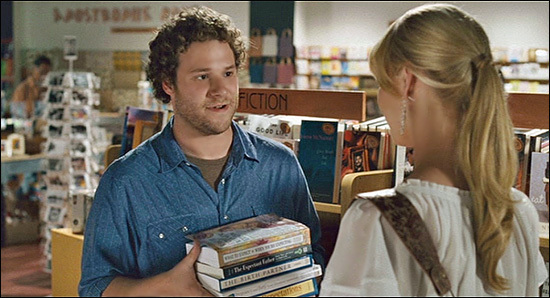 When our store was in Pasadena, before we moved it to Belmont Shore, our store was used as a filming location for the movie, KNOCKED UP. It was a great experience having the cast and crew in our store for three days of filming. It was funny how many people would come by the store when the film was released and realize they were actually somewhere where a silly, but humorous film was shot (well, a small part of it anyway). Some of their reactions were pretty funny! On September 8th, 2013, My Escuelita celebrated its grand opening in Redondo Beach, California with an enthusiastic group of family members, colleagues and community members. My Escuelita: Spanish For Kids was co-founded by Irma Vázquez as a means of providing quality Spanish instruction to young children through art, play, exploration, dance, yoga, music and literature. 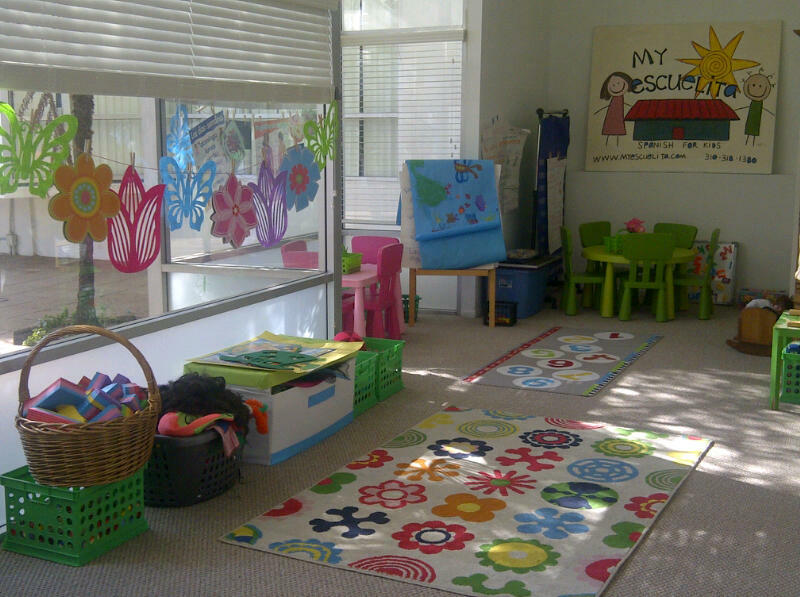 Many moons ago, Irma would say she wanted to open her own preschool. Steadfast on making her dreams a reality, she pasted this quote on a red folder and never looked back. And today, many moons later we gather together in celebrating My Escuelita’s one year anniversary. It’s been a year since you opened the Redondo Beach site for My Escuelita. How has this year been? In one one word, magical! It has been a journey like no other – Bringing families together, teaching young children, hosting cultural events, solidifying my own teaching pedagogy, building community around a very tiny 500 square feet of space. Briefly tell me your personal goal or mission for My Escuelita? My goal is to inspire and assist families on the road to learning a second or third language. My mission is to help families embrace not only Spanish as a language, but as a gateway into the abundance of the culture. My grand opening on my 45th birthday in September 2013 was the most memorable because My Escuelita was packed with people who have supported me on this journey. The smiles on the children, my proud family and all of my friends made the day and birthday extra special! Some of the challenges as any business owner would say is running a business. I love teaching and being an entrepreneur. It is not only exciting but keeps you super super busy. Balancing my passion for teaching students and being the boss has been the most challenging part of having my own space. But I have found an abundance of support in both the teaching and business community…and that has made all the difference. What would you like your community to know? I would like my community to know that everything I do, from teaching to developing curriculum is done with love for children and a deep desire to offer the best practices in language learning. I also want my community to know that my language teaching practices comes from the interest of their own child. Lastly, I would like my community to know that I am a parent first. And as a parent I know they want their child to be cared for, respected and creative. How do you find inspiration to keep going? My family and friends are my village and they support me unconditionally. The community of teachers, artists, musicians, etc. that have come to My Escuelita this year continue to inspire me. But at the end of the day what inspires me the most are the students I teach. They encourage creativity, passion and a yearning to do my very best each and every day. Congratulations again on providing a community where the richness and vastness of the Spanish language and it’s diverse culture can be explored and celebrated! My Escuelita will have an Open House on Saturday, October 11th, 2014.